What’s going on with Chicago’s first responders? Has the Chicago Fire TV show been cancelled or renewed for an eighth season on NBC? The television vulture is watching all the latest cancellation and renewal news, so this page is the place to track the status of Chicago Fire season eight. Bookmark it, or subscribe for the latest updates. Remember, the television vulture is watching your shows. Are you? The seventh season of Chicago Fire is averaging a 1.24 rating in the 18-49 demographic and 8.16 million viewers. Compared to season six, that’s up by 15% and 37%, respectively. 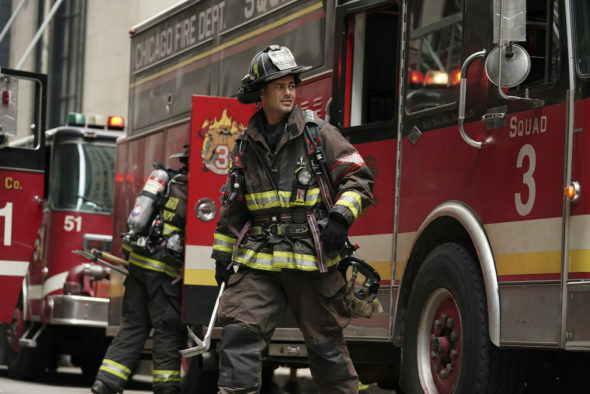 Find out how Chicago Fire stacks up against other NBC TV shows. On February 26, 2019, Chicago Fire was renewed for an eighth season, with a start date TBD. Stay tuned for further updates. Will NBC cancel or renew Chicago Fire for season eight? Although the ratings have dropped over the years, this show is the foundation of the franchise, so I would expect good advance notice when the end is nigh, rather than a cancellation in the classic sense. Still, I’ll keep a hungry on the ratings and update this page with breaking developments. Subscribe for free Chicago Fire cancellation or renewal alerts. TV show ratings are still important. Follow the Chicago Fire weekly ups and downs. Find more Chicago Fire TV series news or other NBC TV show news. What do you think? Are you happy the Chicago Fire TV series was renewed for an eighth season? How would you feel if NBC had cancelled this TV show, instead? I hope they don’t cancel any of the Chicago shows. They are the only ones that I watch. These are the BEST shows on TV!! LOVE IT. Im in South Africa and we all love this show.